My friend, Zhu of Correr Es Mi Destino encouraged me to take part in this photography contest. Basically you share a photo that represents the colors blue, red, green, yellow and white. I decided to go through my photos from last year’s trip to El Salvador and see what I could find. 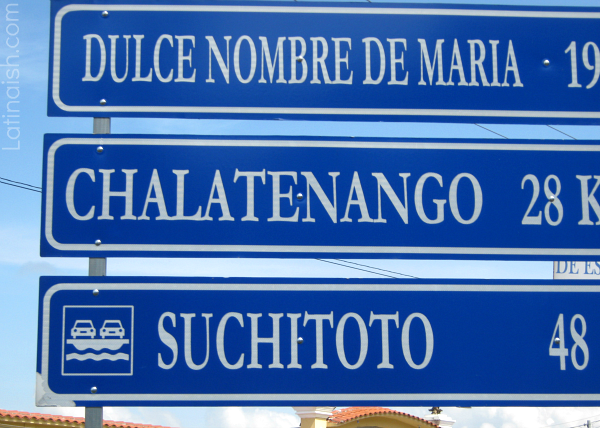 A sign on our way to Chalatenango to visit family. This is my younger son eating a paleta while we wait for Carlos to finish paperwork at DUI Centro. In El Salvador, DUI doesn’t mean “Driving Under the Influence” – it means “Documento Único de Identidad” – it’s an ID card. Waiting at DUI Centro is kind of like waiting around the DMV, except family members aren’t allowed inside – possibly due to space limitations but the windows were tinted which made me think there might be other reasons. Also, before they give you your ID, you have to answer all kinds of questions, like whether you have tattoos. If they don’t believe you, they sometimes ask you to take off your shirt so they can check. Anyhow, this paleta was really cheap – I can’t remember how much but I remember I bought a few paletas for my sons and our friends who had taken us to DUI Centro but it still didn’t add up to five dollars – and the smallest bill I had on me was a five dollar bill. The paleta man was very distraught and started asking random people if they had smaller bills so I could trade with them and so he could give me proper change. No one had change or at least no one wanted to get involved in the transaction. I told him it was no big deal and he could keep the change. Paleta man became even more distraught and when I refused extra popsicles, he ended up giving me tons of free napkins to make up for it. Days later Carlos had a similar incident with a paleta man but this paleta man happily took the extra change, his eyes glistening with tears and said “God bless you” a half dozen times. This is Cine Libertad which is an old cinema that closed down. This is Teatro Nacional in San Salvador which is the oldest theater in Central America. This is a “chucho aguacatero” (street dog) in San Salvador. He may have belonged to the owner of the food stall where he was hanging out or maybe he just found a good location for lunch. Here’s a bonus – in this music video by Salvadoran group Pescozada, you can see many San Salvador landmarks, including two places you see in my photographs above. Can you spot them? Also, if you have more time, I encourage you to watch the beautiful short film, Cinema Libertad. Thanks for your comment, Shanito! How nice that you got to live there for a time. Holi smokes!!!! Acabo de ver el cortometraje “Cinema Libertad” . Me recuerda cuando me escapaba de la escuela para ir al cine con el novio, escondia una camisa “particular” en mi bolsón para poder entrar, y sentaditos en lo oscuro agarraditos de la mano viendo Footlose! Ay, what a great memory!!! I loved this little film so much. Glad you enjoyed it too. Great pictures! I am even more excited about moving to El Salvador now knowing what a good deal there is on popsicles — a mí me gustan las paletas. Thanks for the tag! I love these sorts of memes. Love the popsicle shot! My favourite is your entry for rojo, first I love that colour and your interpretation is creative! I love the crop on that pic too. Best of luck to win some travel money! Hi! Que bonita foto del teatro, me gusta ese tono de amarillo. Thanks for thinking of me! Your shots are excellent by the way. We’re still in Bolivia so I’m not sure I can participate right now, but maybe when we get back. I haven’t taken as many shots here as I normally do…been a little sick…but there should be a few interesting ones in there somewhere. No pressure, Susan! I love your photography and can’t wait to see your photos of Bolivia even if you don’t participate in the contest. Enjoy your time and your family – hope you get well!